In terms of its scale and timetable, the new exhibition centre in Basel was not just one of Switzerland’s but also one of Europe’s more unusual jobsites. 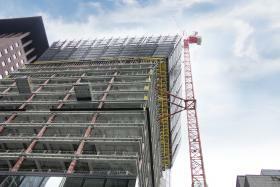 This huge complex, involving a total investment of CHF 430 m. (approx. 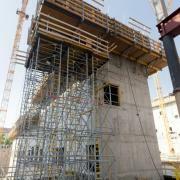 EUR 350 m.), demanded extraordinary construction performance from the contracting consortium MEZEBA. 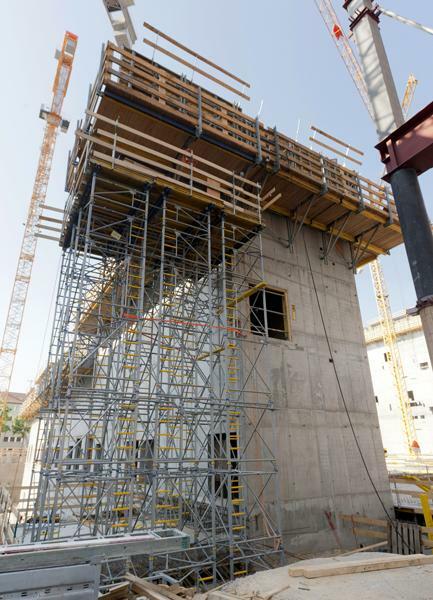 To meet the exceptionally tight timeframe, the consortium relied on formwork, climbing platforms, load-bearing towers and stair towers from Doka Schweiz AG. The exhibition-grounds in Basel have been undergoing a thorough and striking modernisation, completed in 2013. The main parts of this rebuilding project are the enlargement of Hall 1, involving the replacement of the flanking end-building by a new structure with exhibition space on three storeys. The new Hall 3 also has three floors of exhibition space, including a multifunctional event hall in the ground floor. A two-storey linking structure has been built over the fairground to join the two new hall complexes. At ground level, this has created an open, roofed over space with a spacious atrium, known as the City Lounge. The general contractor appointed by MCH Messe Basel, HRS Real Estate AG, had to plan all construction operations to fit around the tradeshow calendar. The MEZEBA consortium, consisting of Anliker Bauunternehmung AG and Obrist AG, was appointed to carry out the complex and very time-pressured construction works. Building work on the new exhibition centre commenced in mid-2010. Following preparatory work in and around the fairground and the tram lines, the main works were carried out in two phases: June 2011 to December 2011: building the linking structure over the fairground. April 2012 to April 2013: demolition of the flanking end-building of Hall 1, and of all of Hall 3, followed by rebuilding. 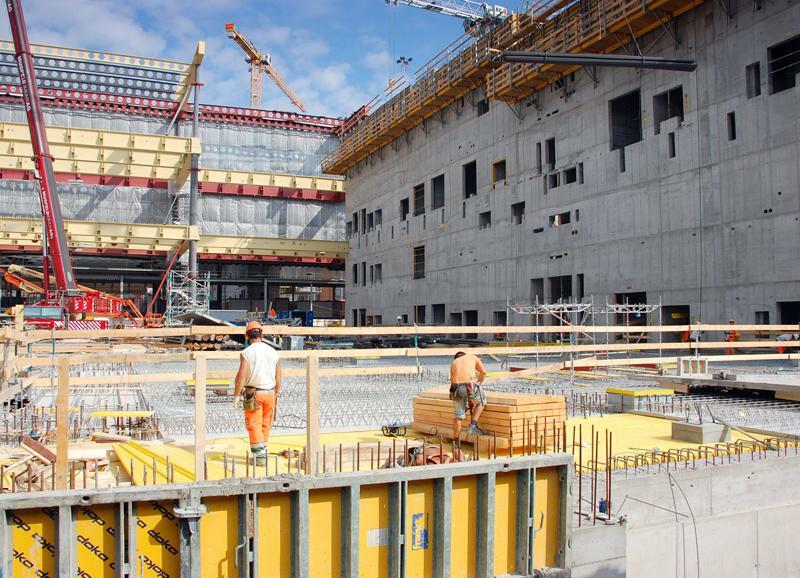 The main construction work started at the end of June 2011, followed through until December by the concrete cores for the new buildings, firstly at the corners of the flanking end-building and then of Hall 3. After this, the linking structure was built, comprising the ‘City Lounge’ and two storeys of exhibition space. 2500 t of sectional steel and 7300 m³ of concrete went into this stage of the project, whose construction volume totalled 160,000 m³. 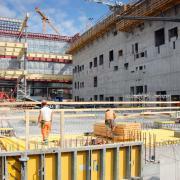 After a three-month pause in construction work – due to two major tradeshows, Swissbau and BaselWorld – the second and final main phase of construction got underway in April 2012. In this phase, through until February 2013, the old buildings or parts of buildings were demolished, and the entire complex of new buildings completed. The new exhibition centre first took visible shape with the 32.00 m high linking structure built over the fairground. This is the centrepiece of the new hall complex, comprising two 8.00 m tall floors of exhibition space above the 10.00 m high ‘City Lounge’. To anchor this linking structure into Halls 1 and 3, concrete support cores were constructed, first at the corners of the flanking end-building on Hall 1 and then at the corner of ‘Messeplatz’ (fairground square) and ‘Riehenring’ (street) on Hall 3. Also, a stabilisation pillar was erected, and new cores cast, on Hall 3 alongside the multistorey car-park. In May 2012, immediately after the demolition work, the piles and base slabs of the cores were constructed, to provide the foundations for the new buildings. Work on the structure shell of the basement levels and cores then commenced. The structural-steel and prefabricated-element work took place from the end of July until the beginning of September, when the structure shell of the new complex was completed. Partially overlapping with these works, the interior fitting work was carried out from mid-August until mid-December. At times, the operations during this last main phase of construction called for as many as twelve site cranes, supplemented during the structural-steel construction phase by up to eight mobile cranes and 20 articulated telescoping platforms of up to 35.00 m in height. No fewer than 4200 t of sectional steel, 45,000 m³ of concrete and 5200 t of rebar were installed in this last phase of the construction work. The SW, SE, NE and NW climbing cores each comprise 13 cores with a pour-height of 3.10 m per casting section. 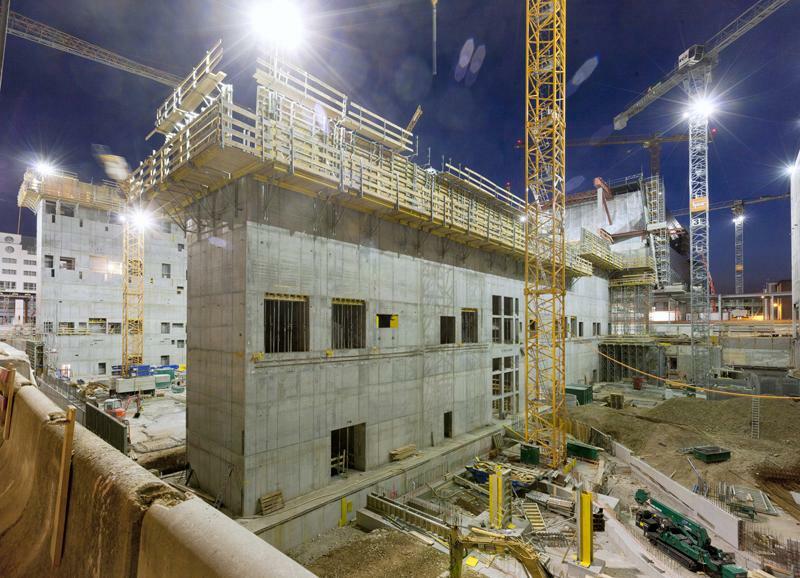 According to Roman Cibolini, Doka Schweiz AG’s project manager on the site, each storey – from the basement level up to the roof storey – required 21,000 m² of formwork to be erected, 1200 m² of it for subsequently poured intermediate walls. The volume of concrete to be placed totalled between 2600 m³ and 3600 m³ per core, 600 m³ of it for subsequent concrete components such as intermediate walls, floor-slabs, cantilever slabs and landing slabs. Around 400 t of reinforcing steel was fitted. The consortium only had three days’ time per climbing cycle, corresponding to six work-shifts. The concrete strength required for climbing was 10 N/mm². Concrete deliveries to the site, where pumping sometimes had to be performed at four different placement locations at once, were made from several ready-mix concrete plants in and around Basel. 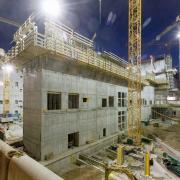 Formwork pre-assembly was carried out at Doka Schweiz’s premises near Zurich, or at an intermediate storage location on the southern outskirts of Basel. From August onwards, it was also possible to temporarily store equipment on the top deck of the exhibition centre’s multistorey car-park. The Framax Xlife 330 wall-formwork panels were delivered to the site just-in-time, stood in the upright in special lorries. The panels were set up straight out of the lorry, with no intermediate storage; to allow this, they were given detailed numbering and each labelled with the relevant excerpt from the plans. This required meticulously prepared schedules of materials, as drawn up by Doka Schweiz, and precision scheduling of site deliveries. 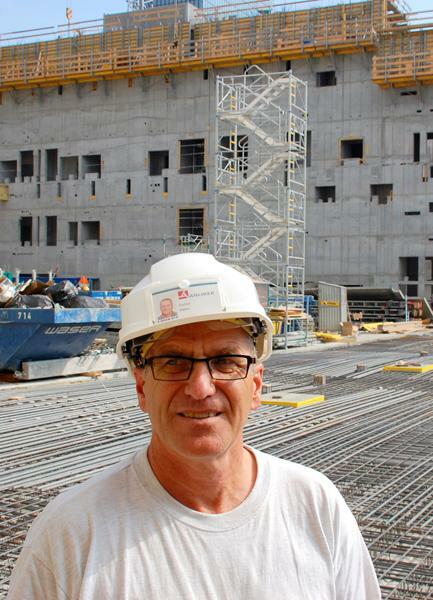 Peter Furrer, the MEZEBA consortium’s Chief Foreman for the southern section of the structure, summed up his experience like this: “Two things stand out about the worksite of the new tradeshow centre in Basel: extraordinarily tight timeframes and difficult logistics. The huge amounts of materials and equipment needing to be moved around on this site stretch the available craneage to the limit. This makes it very important for the large quantities of formwork equipment that we need to be accurately pre-assembled, and delivered directly to the usage location just-in-time, without needing intermediate storage. Unlike almost any other formwork supplier, Doka has got what it takes to get giant quantities like these to the right place at the right time”. 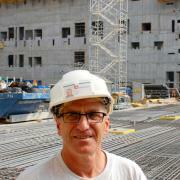 Thank you for your interest - Formwork technology maximised performance in rebuilding of Messe Basel exhibition centre. Thank you very much for your interest - Formwork technology maximised performance in rebuilding of Messe Basel exhibition centre.